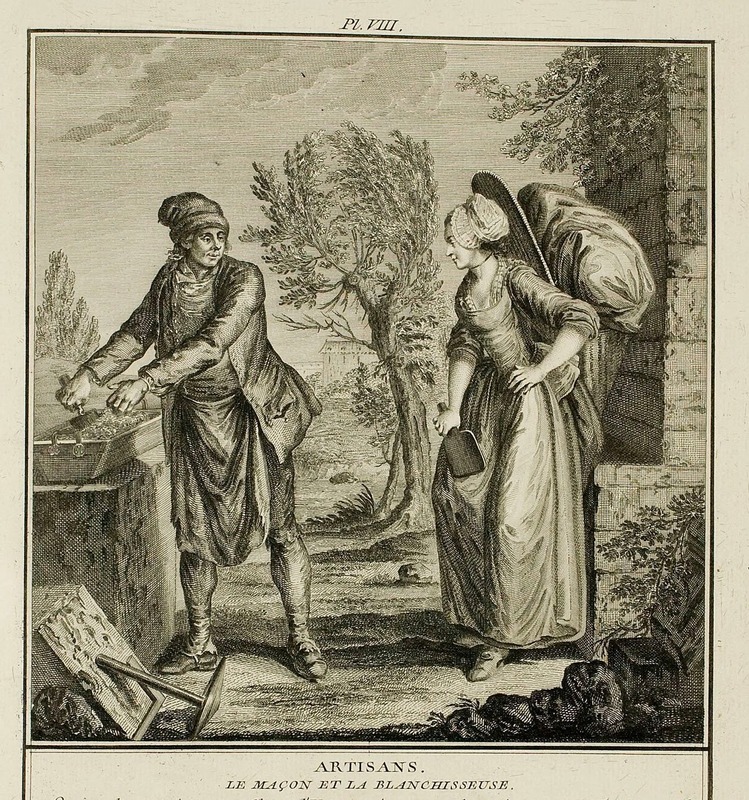 THE MASON AND THE LAUNDRESS. By Artisans one means a Class of Men who devote their lives to mechanical Arts; one of the most essential to society is the Mason. He builds our homes and works to shelter us from the bad weather of the seasons; those who prepare our Foodstuffs for us are at least as useful, but there are others who only work to content our luxury, and those, whether the richest, are not the most necessary to an estate. The rank of Artisans in the Civil Order is after the Merchant, their dress hardly distinguishes them from the Bourgeois, they nevertheless prefer strong colors for their suits, such as a Chestnut-colored coat and a red vest. We have represented here the Mason in a worker's dress, he is in a cap, vest, and apron, working to stir his mortar. Among the female Artisans, we have chosen by preference the Laundress. She is represented dressed following the people of her estate, carrying a basket loaded with linens and the beater in her hand. Laundresses are nearly the only ones who have united and formed in Paris a type of community, they celebrate Mi-Carême* among themselves with a party, they elect on this day a Queen and give her an Equerry; the Master of Ceremonies is usually a Water-bearer. The day of the party arrived, the Queen, supported by her Equerry, is taken into the Boat where Minstrels wait for her; there is dancing and it is she who opens the ball. The dance lasts up to 5 o'clock in the evening. The Knights rent a Carriage to come; the Queen gets in it with her Equerry and the whole gay band follows on foot. They go with her to a Tavern to reunite for the whole night.